warning: Creating default object from empty value in /home/jeffreygough/drupal4/sites/warrantyvoidifremoved.com/modules/spam/spam.module on line 488. Electronic badges are all the rage at IT security conferences these days. 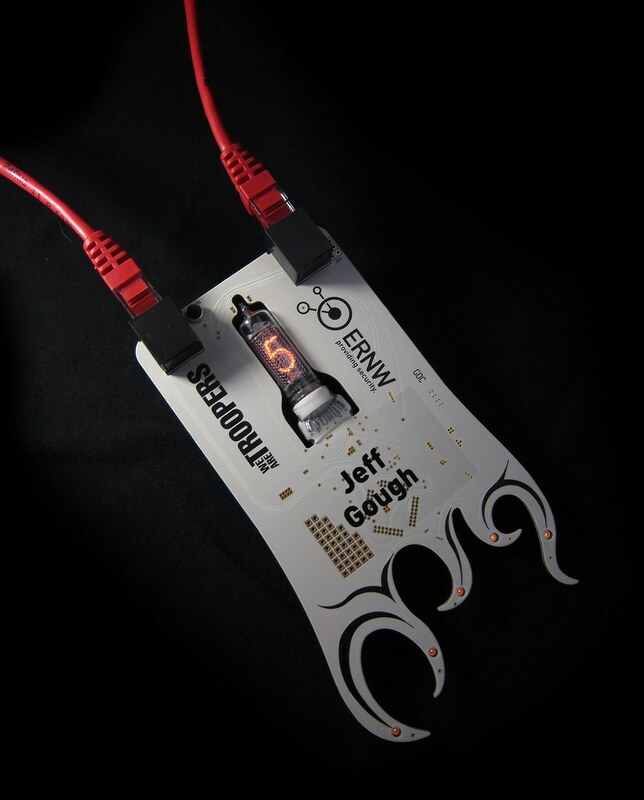 I think DEFCON started it all with badges made by Joe Grand, but there have been many others, like the Sputnik RFID tags at 25C3, the expandable bunny badges at Easter Hegg, Munich, by lilafisch and friends, and Travis Goodspeed's badge for The Next Hope. I created 210 interactive badges for the TROOPERS11 IT-sec conference in Heidelberg last month. They feature some ethereal vintage vacuum glassware - IN-16 nixie tubes made at the Reflector factory in Saratov in the former USSR in 1989. I purchased them new-old-stock from some handy guys in Lithuania. Each conference attendee starts on zero. As they unlock achievements at the con - like sending postcards to their families, meeting the speakers, unlocking the secret in the badge, attending my SMT soldering workshop, etc, attendees level-up. Those who reached the highest levels were entered into a prize draw to win hacker goodies. I designed this levelling-up concept to connect with the central themes of the TROOPERS conference - personal progression, education, and becoming better IT security professionals. Florian did an amazing job of weaving the badge and the game concept into the very fabric of the conference. The badge hangs around the neck from a CAT5 cable, rocking the network security image. Red for the speakers, green for everyone else. 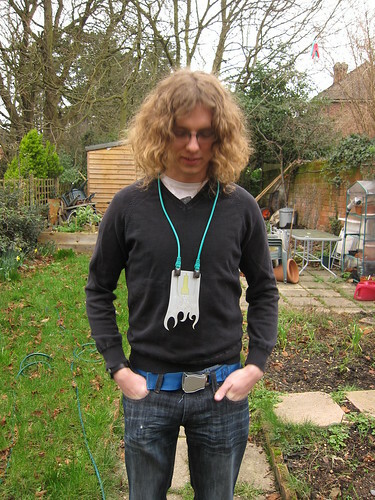 Here I am wearing the bare, prototype PCB. Have you any idea how difficult it is to find 750mm CAT5 cables? It's quite difficult. As well as being the LANyard (sorry) the cable functions as the power switch, levelling-up mechanism, programming interface and debug output (and attack vector for intrepid hardware hackers!). When an attendee unlocked an achievement, he took his badge to the information desk where one of the organising staff would plug in a special dongle to update his score. 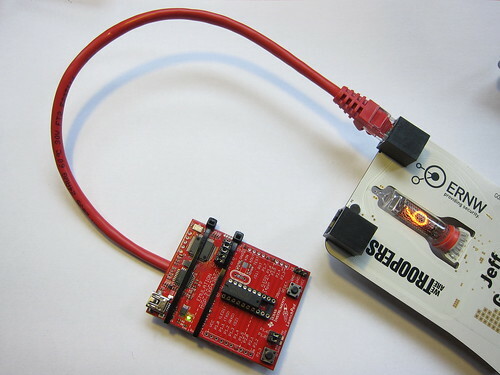 The dongle is simply a TI Launchpad (MSP430G2231) with a CAT5 cable soldered on, running some custom firmware to transmit a magic byte over SPI to the badge. The batteries and electronics are on the back of the badge. You can download the design materials here . The hardware is licensed under the Creative Commons Attribution-NonCommercial-ShareAlike 3.0 Unported License. The firmware is licensed under the GPLv3 . If you just want a quick look at the schematic, it's available separately here . 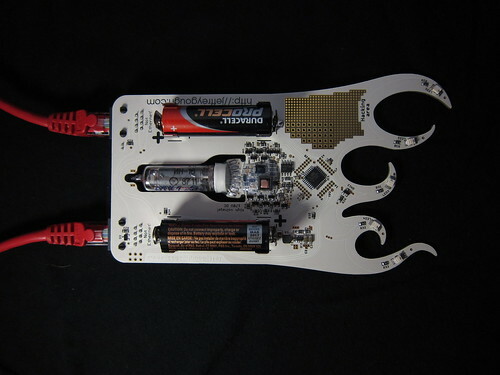 The badge is powered from two AA batteries. The nixie tube uses most of the power, so I could basically trade nixie shininess for battery life. I chose a gentle fade-in-fade-out animation, with the duty cycle set for around 40 hours of use. The output voltage of an alkaline cell decreases nearly linearly as it is discharged. Even when it reaches 0.9V or less it still contains a decent amount of energy. To make full use of the energy in the battery the badge must work from a supply voltage of 1.8V or less. The nixie tube needs around 150-170V at 1.8mA. I use an MCP1640 DCDC to boost the battery voltage up to 5V to power the low voltage electronics, microcontroller, etc. Then I use a microcontroller-based DCDC to get from 5V up to an adjustable voltage between 0 and 200V. It's quite difficult to get from 5V to 150V efficiently and cheaply with a standard boost topology, so I use a flyback topology with a small transformer. Whilst small, high performance, SMT inductors are completely ubiquitous, similar transformers are not. This is due to low industrial demand. Camera flash circuits (which, just like my nixie supply, must step from battery voltage to 150-300V) are about the only application for small transfomers. They are only made by a few large companies, and only leave the East inside cameras. I got mine from Tokyo Coil Engineering, and I really owe them a favour! They usually sell in enormous volume to people like Sony and Casio. I used an ATmega48 because it was the cheapest microcontroller around with enough timers, IO and ADC channels. I don't really like AVR's. Their fuse system is a real pain in the arse (fuses in general are a pain in the arse) and they have about 10 different proprietary programming and debugging interfaces. But hey, people seem to like them, and the price was right! The AVR produces a PWM signal that switches the FET on the primary side of the transformer, and the voltage is boosted on the secondary side both by the turns ratio and inductance of the transformer. The voltage is attenuated and buffered, and fed back to the AVR's ADC. The firmware measures the high voltage supply via this attenuation, and adjusts the PWM setting using a PID control scheme. The PWM output is capacitively coupled into the FET gate so that the FET doesn't blow up if the AVR crashes. The efficiency is pretty good; 75-80% depending on voltage setting, etc. Instead of using a resistor to limit the current through the nixie tube, I used a 1.8mA active current source. I designed it this way with the intention of using a high voltage to strike the neon then reducing the voltage to minimise power dissipated in the current source. Quite an elegant idea, I thought, but I ended up manipulating the DCDC voltage to fade the nixie in and out, rather than dimming it with another PWM channel. So if anything, the current source was probably a slight hindrance because it made the nixie brightness much less sensitive to supply voltage. Never mind, it all turned out nicely in the end! The 12 individual nixie cathodes (0-9, left and right decimal points) are switched by high voltage NPN transistors.. The speakers' badges have sound-activated LED's. An electret microphone captures the sound, and it's amplified and fed to the AVR's ADC. Foolishly I biased the mic directly from the 5V rail, which turns out to be pretty noisy when the nixie is at full brightness. I ended up writing a horriffic firmware workaround to dynamically adjust the microphone gain based on the nixie voltage. It worked fairly well, but the sensitivity is still low when the nixie is bright. The CAT5 connectors expose the ISP programming interface for flashing the AVR, the SPI port, which is used to increment the score, and a 5V UART which can be used for live debug, etc.There's also a capacitive touch button hidden in the ERNW logo. I was, as usual, working right up to the deadline for this project, and ended up writing a lot of the firmware in Heidelberg. 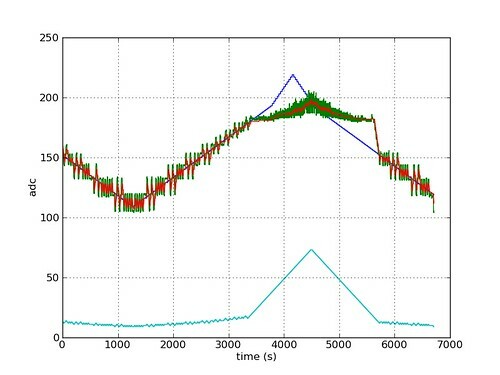 I wanted to work around the microphone noise problem, and suspected that I could reduce the noise by improving the high voltage control scheme. Initially I was using a very rough control scheme that either incremented or decremented the DCDC PWM value depending on whether the voltage was below or above the desired setpoint). Since one PWM step makes a significant impact on the output voltage, the whole thing was pretty nasty - too much oscillation when the setpoint was low, and failure to actually reach the setpoint when it was high for only a short period. I decided to hunker down in my hotel room, get the badge to stream live data out over the UART, and plot some graphs in python to see what was really going on. My original, crappy, control scheme. The green trace is the DCDC output voltage. The red trace is a moving average of this voltage to take out a bit of noise. The setpoint (desired voltage) is in blue, and the value of the PWM signal delivered to the FET is shown in turquoise. The output voltage roughly follows the setpoint, but it is very wobbly when the setpoint is low, and can't quite keep up when it is high. Note I am ramping the setpoint up and down to get the nixie to fade in and out.The change in gradient near the top of the peak is deliberate - it makes the fading look more consistent to the human eye. Please ignore the x axis label. It isn't actually graduated in seconds. This whole graph probably shows about 5 seconds of data, not several hours! The PID control scheme is a dramatic improvement. 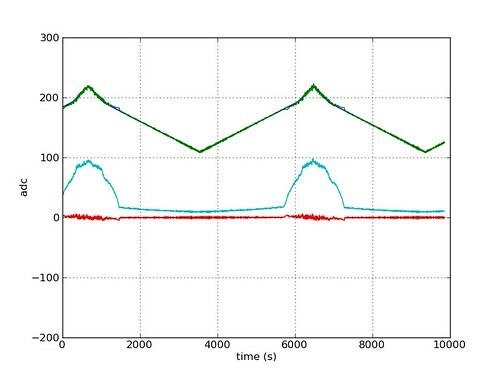 The output voltage (green) tracks the setpoint (blue) perfectly. To achieve this, the PWM value (turquoise) is being adjusted in a much more subtle way than before. The red trace shows the error (difference between the true output voltage and the setpoint). Next I worked on the microphone noise cancellation. 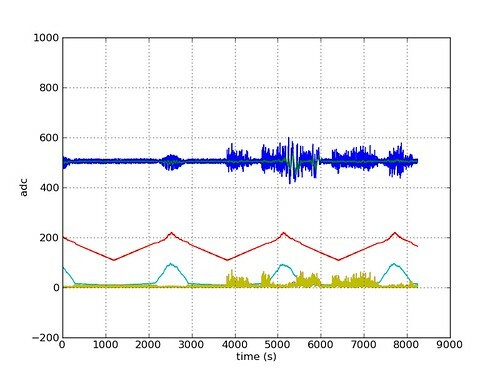 The blue trace is the microphone voltage (recorded in silence). Note the "blob" of noise when the nixie voltage (red) is high. The green trace is a very long moving average used to establish the DC level of the microphone reading. The turquoise trace shows the PWM values being delivered to the FET. I used this signal as the basis of the cancellation function because its shape is very similar to the noise "blob" in the microphone data.. Here are the results. The blue trace is the input, as before.The yellow trace is the processed signal. On the left I was silent. 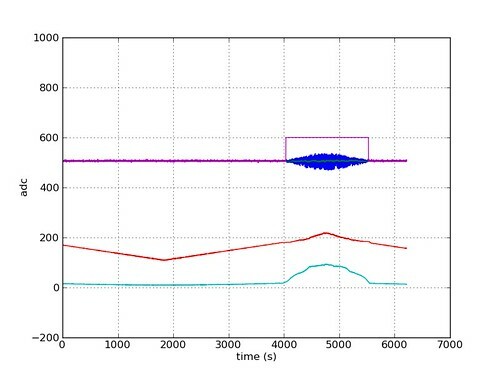 The DCDC-induced noise "blob" is successfully filtered out, but speech (right half) is largely passed through. Sensitivity is pretty crap when the DCDC voltage is high, but it's the best I can do without a hardware fix! The firmware is written in C, compiled under linux with avr-gcc, and flashed to the badge with avr-dude. I use the AVR Dragon programmer, but there are other options available. At the con, Kevin Redon dumped the firmware binary out using a Bus Pirate, made some modifications, and pumped it back in. He also scored himself an instant 9 by editing the EEPROM image. Respect. Several other guys performed some simple hardware hacks too, shorting segments on, etc., but Kevin's work was the most impressive I saw. If you're a masochist, you can also debug the AVR over Debugwire using avarice and gdb. It's unbelievably flaky, though. The firmware is highly modular and fairly self-explanatory. It is largely interrupt based, making extensive use of the timer peripherals. Lots of people asked me about this. It's just an empty bit of board with some 0.1" spaced through hole pads and 0.05" spaced SMT pads where you can solder on your own components. The conference attendees are mostly software guys. I wanted to give them a platform that is really easy to hack so that those with budding hardware hacking interests have a low barrier to entry. For maximum flexibility, no electrical connectivity is provided. You can just use wire. I also broke out every pin of the AVR to a pair of through-hole solder points for maximum hackability. So say you want to make your badge into a clock, you could solder a crystal onto the AVR's clock pins. Or if you want to add some radio functionality you could solder your radio chip onto the hacking area, and wire it up to the AVR. Go nuts - totally freeform hacking space. The high voltage section is insulated with heatshrink sleeving and self-levelling silicone encapsulant (great stuff, by the way). If you dig your way through it is possible to get a mildly painful shock, but there isn't enough energy stored in the DCDC to do you any harm. Don't take my word for it, though. If you're ancient / part cyborg / whatever, I wouldn't push your luck! A closeup of the assembly jig. 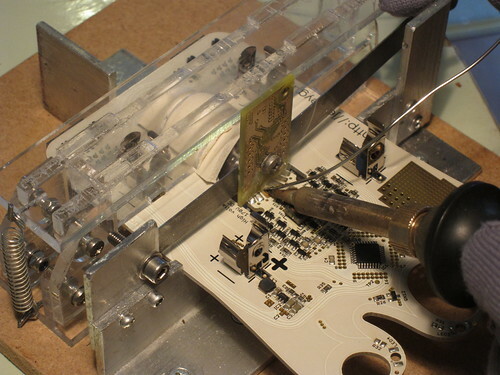 The perspex assembly (rear) holds the nixie perfectly centred within the cutout in the PCB. The spring steel, aluminium and FR4 assembly (front) clamps the legs down onto the PCB, leaving both of my hands free to solder. It turns out that 210 is quite a lot of things. So if you're the lucky owner of a TROOPERS badge, I hope this information inspires you to hack it to do something new! At the very least, please take care of your nixie tube! They are a scarce resource. They haven't been manufactured since the early nineties. I held a little SMT soldering workshop at the con, where attendees could upgrade their badge to speaker status by soldering on the extra LED's, resistors and microphone. 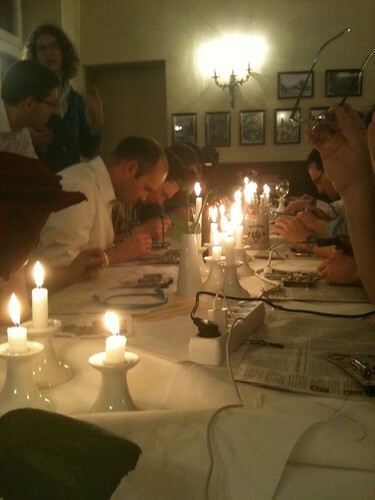 Someone remarked that it was probably the most romantic soldering workshop ever! (Thanks to Insinuator for the photo). Once again, many thanks to Florian, Enno, Daniel and all at ERNW - thoroughly enjoyed it! Please ask questions in the comments / by email / twitter, and I'll help you out. If you're running your own con, and would like some similarly insane badges, give me a shout. Have a look at my flickr account / youtube channel for more media. Submitted by Anonymous on Wed, 02/28/2018 - 08:08. Submitted by Anonymous on Sat, 03/03/2018 - 23:11. Submitted by Anonymous on Mon, 03/05/2018 - 10:31. Submitted by Anonymous on Mon, 03/05/2018 - 16:16. Submitted by Anonymous on Mon, 03/05/2018 - 17:41. Submitted by Anonymous on Mon, 03/05/2018 - 17:47. Submitted by Anonymous on Mon, 03/05/2018 - 23:56. ????? ??????????? ??????? ??????? ?? ?????? ??????? Submitted by Anonymous on Tue, 03/06/2018 - 02:53. Submitted by Anonymous on Tue, 03/06/2018 - 12:28. ??? ??????? ???????????? ???? ? ??? Submitted by Anonymous on Tue, 03/06/2018 - 20:49. Submitted by Anonymous on Thu, 03/08/2018 - 04:29. Submitted by Anonymous on Thu, 03/08/2018 - 18:36. Submitted by Anonymous on Sat, 03/10/2018 - 05:13. Submitted by Anonymous on Sun, 03/11/2018 - 14:39. ???????? ?????? ? ??????? ??????? Submitted by Anonymous on Thu, 03/15/2018 - 06:40. Submitted by Anonymous on Fri, 03/16/2018 - 04:39. Submitted by Anonymous on Fri, 03/16/2018 - 23:02. Submitted by Anonymous on Tue, 03/20/2018 - 02:27. Submitted by Anonymous on Tue, 03/20/2018 - 11:54. Submitted by Anonymous on Tue, 03/20/2018 - 20:14. Submitted by Anonymous on Thu, 03/22/2018 - 03:06. Submitted by Anonymous on Fri, 03/23/2018 - 07:07. ?????? ??????????? ????? ? ?????? ?? ?????? Submitted by Anonymous on Sun, 03/25/2018 - 15:59. ???????????? ??????? ?? ??????? ?????? Submitted by Anonymous on Mon, 03/26/2018 - 20:27. Submitted by Anonymous on Wed, 03/28/2018 - 04:23. Submitted by Anonymous on Thu, 03/29/2018 - 04:34. Submitted by Anonymous on Thu, 03/29/2018 - 09:13. Submitted by Anonymous on Thu, 03/29/2018 - 09:38. Submitted by Anonymous on Fri, 03/30/2018 - 10:03. Submitted by Anonymous on Sat, 03/31/2018 - 13:54. Submitted by Anonymous on Sat, 03/31/2018 - 19:34. Submitted by Anonymous on Sun, 04/01/2018 - 21:01. Submitted by Anonymous on Tue, 04/03/2018 - 16:01. ????? ?????? ??????? ??????? ??? Submitted by Anonymous on Fri, 04/06/2018 - 11:48. Submitted by Anonymous on Fri, 04/06/2018 - 17:00. Submitted by Anonymous on Sat, 04/07/2018 - 06:49. Submitted by Anonymous on Sun, 04/08/2018 - 08:08. Submitted by Anonymous on Mon, 04/09/2018 - 05:26. Submitted by Anonymous on Mon, 04/09/2018 - 18:42. Submitted by Anonymous on Mon, 04/09/2018 - 21:05. Submitted by Anonymous on Tue, 04/10/2018 - 16:00. Submitted by Anonymous on Tue, 04/10/2018 - 21:53. ??? ??????? ???????????? ???????? ??????? Submitted by Anonymous on Thu, 04/12/2018 - 15:32. ??????????? ?????????? ????? : ??????????? ?????? ?, ???????????? Submitted by Anonymous on Thu, 04/12/2018 - 15:44. Submitted by Anonymous on Sun, 04/15/2018 - 21:57. Submitted by Anonymous on Mon, 04/16/2018 - 09:53. Submitted by Anonymous on Mon, 04/16/2018 - 11:32. Submitted by Anonymous on Wed, 04/18/2018 - 12:18.